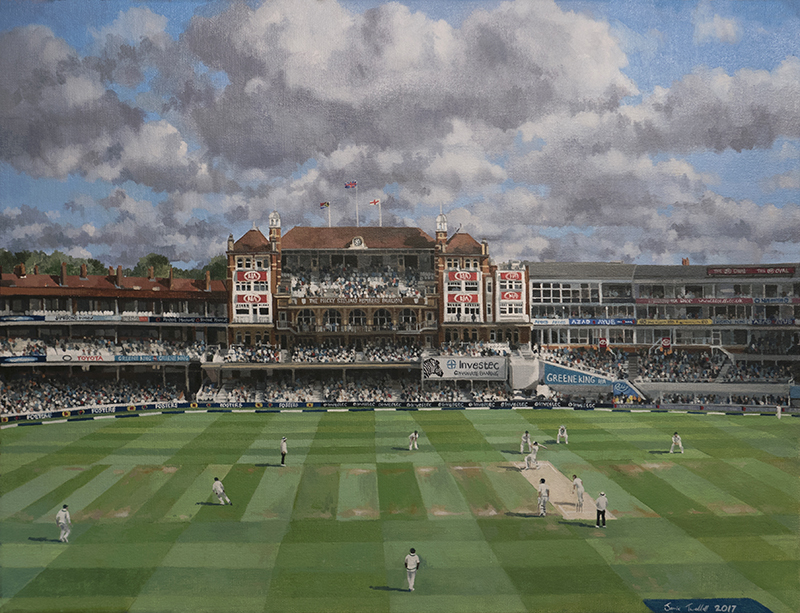 I was honored to be asked by Surrey Cricket to paint the100th Test Match played at The Oval Cricket Ground, a game between England and South Africa in July 2017. 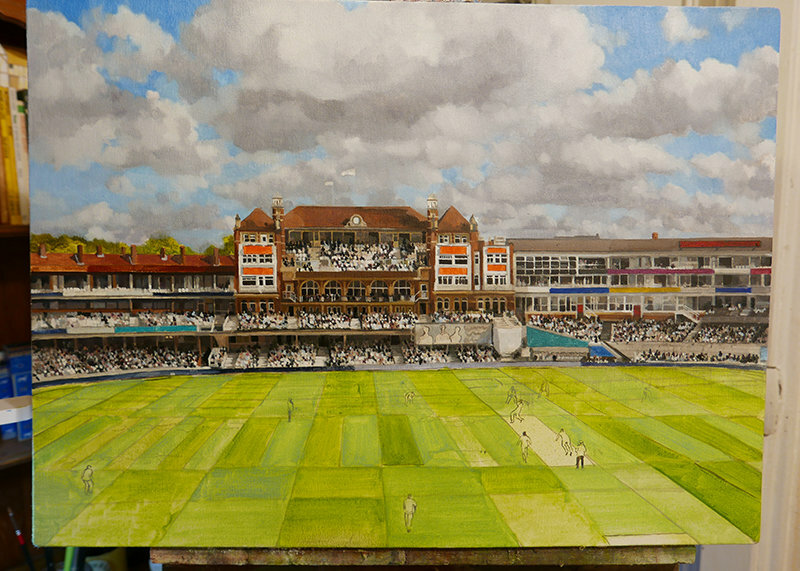 After attending every day of the Test match and discussing with the client their expectations and wishes for the painting the process of working through sketches and photographs taken during the Test match begins. It is very important to ensure that you take many photographs of the play from different parts of the ground to capture the different light conditions throughout the game. If possible, I like to make a few rapid oil sketches to capture the essence of the scene. I particularly love the deepening green shadows of the post tea session when parts of the ground blaze with late ocher summer sun and others thrown into tenebrous shade. Back in the studio I tend to use a 'collage' of images to create the composition. For example to provide details of the action and avoid vast swaths of empty green space the players scale generally needs exaggeration. Using the tried and trusted grid technique, I then draw the composition out with thinned oil directly onto the canvas. I like a 12oz cotton duck surface sized with Rabbit skin glue and then primed with white Gesso. This provides a robust surface, which absorbs paint for washes but will also take thicker paint without loosing the detail of the brush marks and retains vibrant colour. 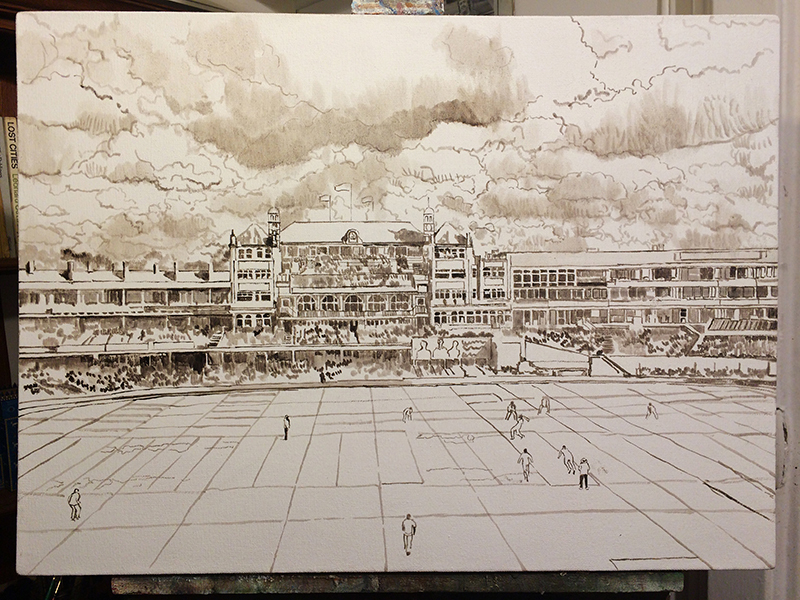 I can now start adding washes of opaque, thinned down oil paint to map out the essential colours of the picture. You don't need to be too precious at this stage as anything you add now is unlikely to remain on the surface of the painting although it's important not to obliterate the drawing under the washes. Next begins the long process of tightening up, remodeling, refining and adding detail. Again, don’t get bogged down in minutiae during this process. I tend to keep moving around the whole canvas to ensure that one area doesn't become too ‘worked’ whilst another remains practically a sketch. This can lead to an imbalance of style in the finished piece. Don't get precious, be critical, don't be afraid to rework, remold and revise. During this stage of a detailed and sizable painting you can complete many, many hours of work without seemingly affecting the overall appearance. Much like the middle of Marathon you need to keep going, dot after dot of that Oval full house crowd. Gradual evaluation, revision and improvement. At some point all that work starts to coalesce into something more solid. It's still crucial to retain the 'appearance' of a light touch in the brush marks however, even if you've worked over and revised an area five or six times. Make sure that the colour doesn't become turbid, that it seems fresh and untutored. The trick is to make deliberation appear spontaneous, intention unintentional. This remains for me one the central paradoxes of the creative process, something which requires a huge degree of effort must appear effortless. In return, particularly when painting an oil sketch at the scene, moments of unforeseen and spontaneous invention often serve to prompt deliberation about how these ideas or techniques can be incorporated into, or provide the basis for a larger work. I think it's the same with music and literature. A writer is not likely to publish a phrase simply because it ‘effortlessly’ popped into their head; good writing is rarely produced in an unreflective gush, musical 'improvisation' is built on a scaffold of theory, phrasing and above all, practice. 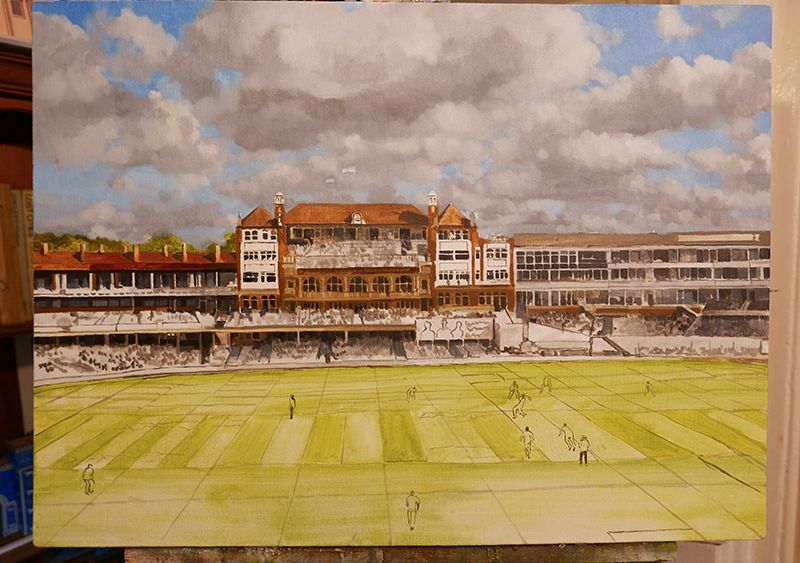 It's time to begin working on the details of the painting, especially the players themselves. I like meticulous accuracy when it comes to depicting specific moments. 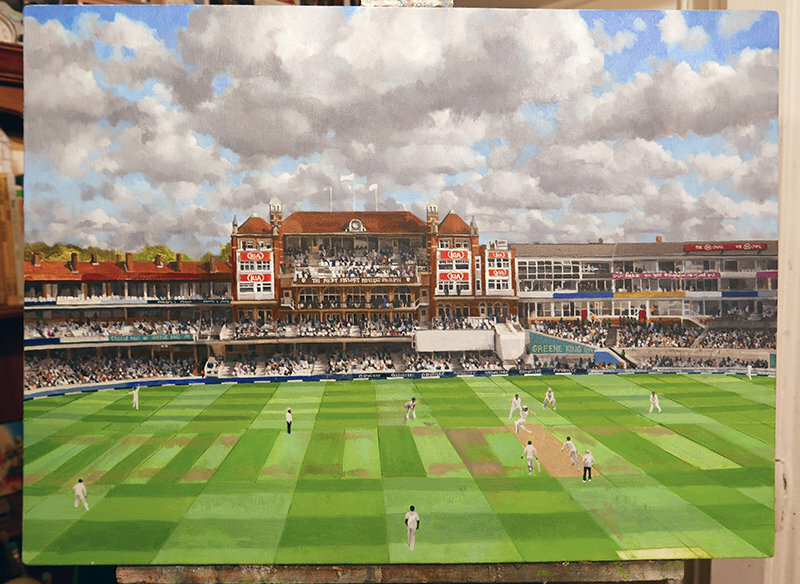 For this paining to commemorate the 100th Test Match played the The Oval cricket ground I decided to celebrate the moment when Ben Stokes smashed a delivery by Maharaj deep into the OCS Stand to reach a sparkling century, the second of three sixes hit in a row by Stokes. It was a great moment during the game. 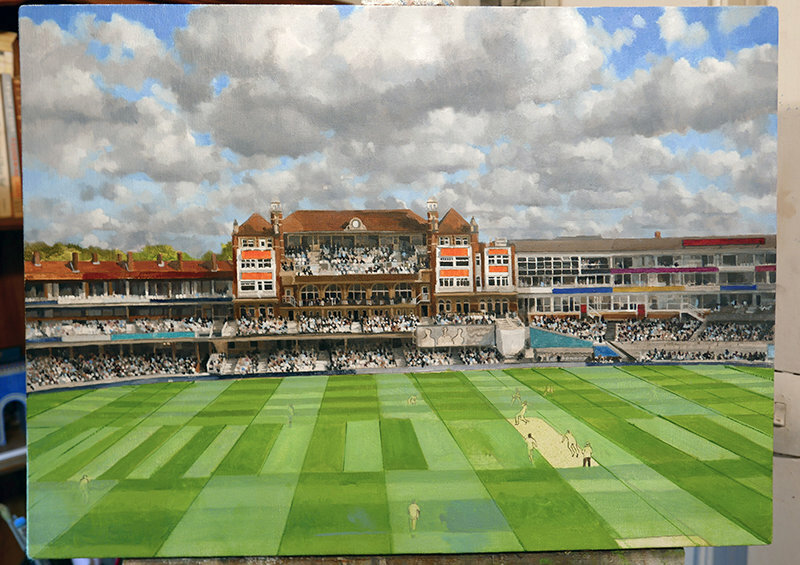 The positions of the fielders and Jimmy Anderson trailing his bat at the non strikers end are all positioned accurately despite using a variety of different shots of players to create the composition. 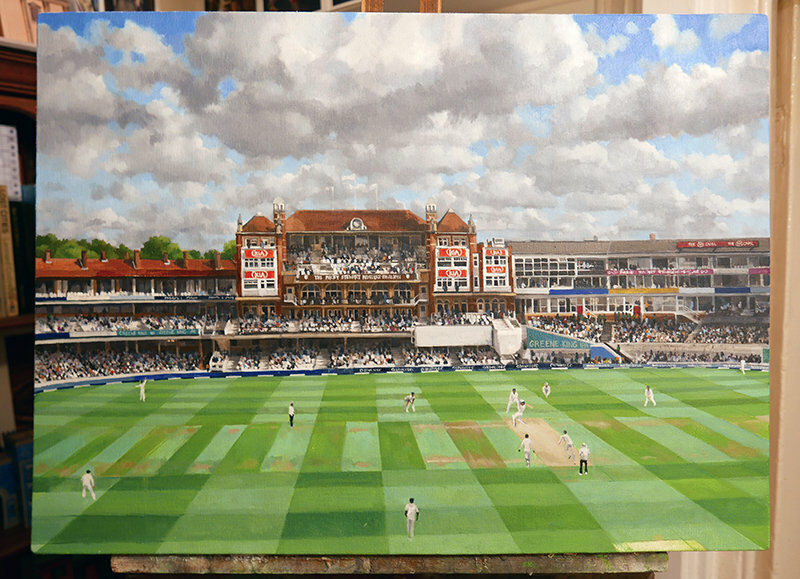 Please don't hesitate to get in touch with me if you would like to commission your own painting of your favourite ground, club, golf course or landscape view.